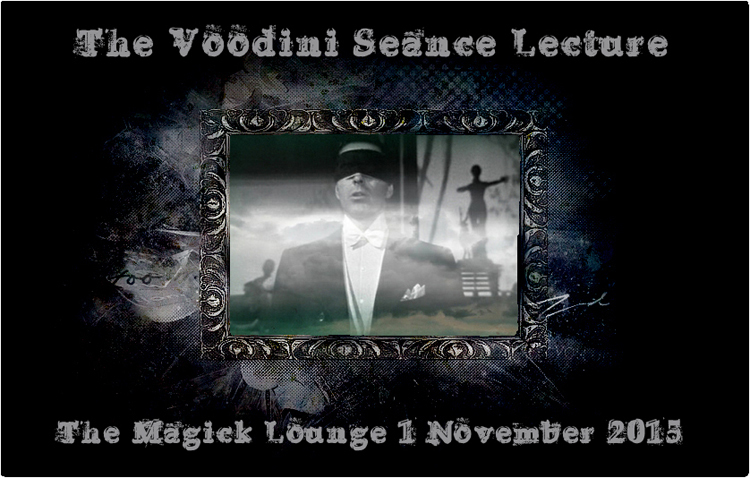 I’m very pleased to announce that on Sunday 1 November (All Souls’ Day) The Magick Lounge will be hosting The Voodini Seance Lecture. Paul Voodini will present a unique lecture and workshop covering the areas of seance, paranormal entertainment, spiritualism, and cold reading. Paul has worked professionally for many years as a seance host, ghost walk host, tarot card and palm reader, and has worked for some of the UK’s leading ghost hunting and paranormal event companies. Paul is proud to present his years of experience in a unique lecture and workshop format aimed especially at magicians, mind-readers, and those wishing to provide entertainment with a decidedly paranormal theme. The event will run from 10.00 a.m. until approximately 4:00 p.m. The morning session will cover all aspects of what is commonly known as cold reading – what it is, what it isn’t, how to employ it, and other methods of providing ‘readings’, before moving into the realms of seance and the paranormal. We will then break for lunch before resuming the afternoon session. The afternoon will be occupied with seance, the paranormal, and ghost hunting. All aspects of this intriguing branch of mentalism and bizarre magick will be analysed and explored, before we finish with an experiment with ‘the talking glass’ (glass moving) and an actual seance. This promises to be both a highly informative and highly entertaining day. Paul is passionate about this work and has written prolifically on the subject matter. You will be taken on a journey through the ‘dark side’ guided by perhaps the most knowledgeable person in the UK when it comes to the art of combining the esoteric with entertainment. All those who buy tickets will also receive, free of charge, a copy of Paul Voodini’s seminal PDF The Paranormal Entertainer. This PDF has a value of £18 and will be emailed out to you completely free of charge shortly after you purchase your tickets. If you already own The Paranormal Entertainer you may request that it be substituted for another PDF(s) of equal value, or the £18 value be deducted from a more expensive purchase. The ticket price for this exclusive day-long event is £45. Due to the intimate nature of the venue, ticket numbers are extremely limited so please don’t delay in booking your place. Paul will email confirmation of your seat at the lecture within 24 hours of purchase. No physical tickets will be issued. If you wish to substitute your free copy of The Paranormal Entertainer with a different PDF, please email Paul at sheffieldmagic@hotmail.co.uk. To confirm, this exclusive lecture/workshop is on Sunday 1 November at The Magick Lounge, 82 Broad Street, Sheffield. S2 5TG. Doors open at 9:45 a.m. The ticket price of £45 includes a buffet lunch and Paul Voodini’s Paranormal Entertainer PDF emailed to you. Please book early to secure your place at this event… a day not to be missed!